Banu and Komsie live on different continents, yet they share a daily struggle. Every morning, they collect water for their respective families. They don't turn on the faucet in their kitchen. Komsie walks for two hours to a dry riverbed, waits in line for two more hours and then starts digging. Once she has secured fifty pounds of water, she places it on her back and begins a two-hour walk home in the sweltering sun. To collect enough water for her family, Banu makes her 40-minute roundtrip journey to a contaminated pond two to three times each day. On the way home, they each worry whether the water they collected will harm their family. Komsie has already lost one child to disease caused by drinking contaminated water. The time spent securing water for their families is time spent not working, so they worry about how they will provide the basics, like food, for their families. Banu and Komsie know that their lack of clean water prevents them and their children from ever attaining a better life. Banu lives with her family in Bangladesh; Komsie lives with her family in Ethiopia. They are both mothers doing their best to provide for their children. They represent two of the 780 million mothers, fathers and children without access to safe water. For Komsie, Banu and mothers like them, safe water can be the difference between life and death, between opportunity and despair. Can you imagine giving your child a drink of water and not knowing if it will harm her? Water-related disease claims the lives of 5,000 children each day, making it the second biggest killer of children worldwide. For their mothers, the danger of unsafe water is more than a statistic. It is a daily fear. 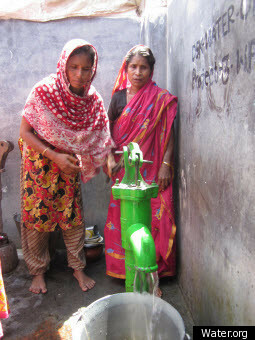 These mothers know all too well that every 20 seconds a child dies from water-related disease such as diarrhea. What's most disturbing is that the death of these children is entirely preventable. We know how to bring people safe water. Solutions are simple, local, and low-cost. We need to deliver these proven solutions more quickly and to pioneer new life-saving solutions. At Water.org, we recognize that there will never be enough charity to dig a well for every person who needs one. Nor is this the best solution for every community. We actively implement a portfolio of solutions tailored to the needs of the individual communities, ranging from providing direct access to pioneering alternative ways to finance and deliver safe water and sanitation. One of our proven innovations is WaterCredit. Pioneered in 2003, WaterCredit applies the principles of micro-finance to the water sector. Through WaterCredit, thanks to the generous support of partners like Johnson & Johnson, more than 340,000 individuals have gained access to safe water and sanitation. By catalyzing small loans to those who do not have access to traditional credit markets, WaterCredit empowers people to immediately address their own water and sanitation needs. A WaterCredit loan can reach five to ten times as many people as a traditional grant over a 10-year period. For mothers like Komsie and Banu, WaterCredit is a small loan that has had a life-changing impact. Today, after receiving loans through WaterCredit, Komsie and Banu no longer make the daily journey to a polluted water source. For both Komsie and Banu, WaterCredit means a clean, reliable source of water right near their homes. Time that was once spent collecting water can now be devoted to their children. Most importantly, they and their families are healthy. March 22nd marks World Water Day. As I write this, 2.6 billion people still lack access to improved sanitation and 780 million people do not have access to safe water. We invite you to help ensure that every individual can have these two fundamental needs met. Together, we will effectively help break the cycle of disease, lost productivity and poverty. Water and sanitation are simply the best investments that the world can make to reduce disease, increase family income, keep girls in school, and enhance human dignity. Pledge $25 at Water.org and provide one person with safe water for a lifetime. A small cost with a huge impact -- a gift that provides women like Komsie and Banu hope, their children health, and their communities a future. For more than two decades, Water.org has been at the forefront of developing and delivering solutions to the water crisis. Founded by Gary White and Matt Damon, Water.org pioneers innovative, community-driven and market-based solutions to ensure all people have access to safe water and sanitation. Water.org is empowering millions of individuals around the world with access to clean water and sanitation; ensuring a better life for generations ahead. For similar stories, go to Women Deliver. Gary White's entrepreneurial vision has driven innovations in the way water and sanitation projects are delivered and financed. White is a founding board member of the Millennium Water Alliance and Water Advocates, a fellow of the British American Project, an advisor to the Clinton Global Initiative, a Skoll Social Entrepreneur, and one of the individuals in the 2011 TIME 100's "100 most influential people in the world."